Specifications: blades 20" or 22", Cat I & II 3(c)point hitch, ripper shank, six sizes of 6'4" to 8'0". Weights: 1345 to 1580 pounds. Options: blade cleaners, add a blade extensions and dirt shields. 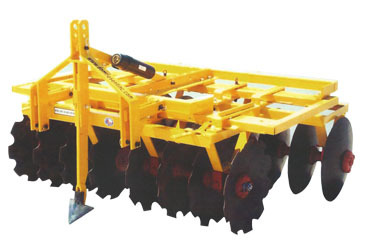 Features: this unique tandem can be easily adjusted for three different tillage operations; normal disking, reverse disking or flat furrowing. Adjusting to any of these three operations can be made easily by removing and relocating pins which takes only seconds. No wrenches are necessary.